The massage industry is a field with ever-increasing opportunities and career options. Massage therapists not only practice and perform therapeutic massage, but they can also administer therapy for health, fitness, and remedial purposes. This makes a career in massage therapy extremely viable as a certificate in massage can take you just about anywhere. Below are just a few of the career options available as a trained massage therapist. The benefits of massage therapy have become widely recognised in the fitness industry. Many athletes and sporting franchises are enlisting massage therapists to help aid in the recovery and rehabilitation of their bodies to remain in peak performance. Health clinics are often in search of sports massage therapists and those qualified in remedial massage as an aid to sports medicine and general health care practices. 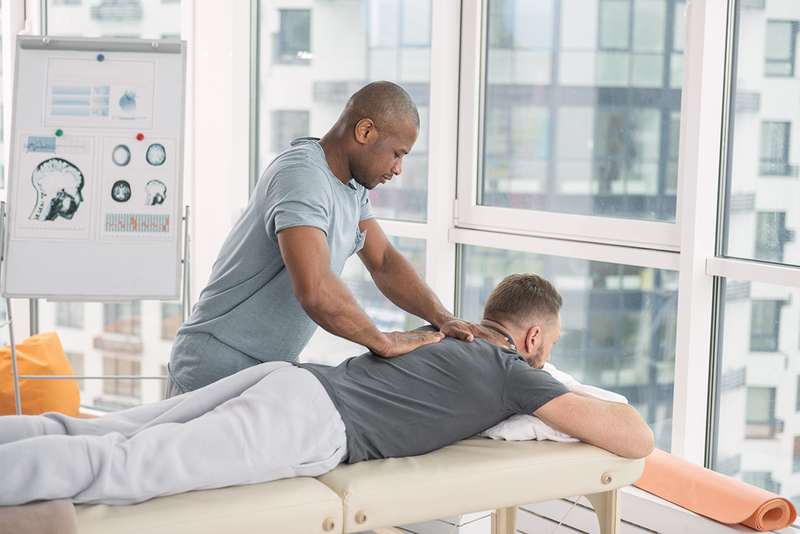 Sports massage therapists generally collaborate with chiropractors, physiotherapists and sports doctors to provide preventative and rehabilitative massage to professional athletes and fitness lovers alike. If you have an interest in sport, fitness, or sports physiology, a career path in sports massage therapy or remedial massage might be for you. Day spas and wellness centres are usually considered the ‘traditional’ line of work for massage therapists, meaning working at them is one of the major career options for a massage therapist. Day spa work is fantastic for those looking for consistency of work and a relaxed, well-maintained environment that allows for camaraderie between co-workers. Clients go to day spas to be pampered and to relax. This can make it a satisfying career as you’re helping clients take a break from their busy lives and allowing them to indulge. Training as a spa therapist will allow you to work at day spas, wellness retreats, beauty parlours, and resorts anywhere in Australia. Due to this, spa massage therapists enjoy a huge range of work opportunities and career progression across a number of specialisations, including aromatherapy massage, hot stone massage, and traditional Swedish massage. Most cruise ships provide onboard day spas for travellers. If you have experience within the hospitality industry or simply love to travel, then training as a massage therapist can open doors to a career where you can work on cruises all over the world. Those who are already training as a massage therapist or are established in the field often see this line of work as the ultimate job. The perks of travel, exploring exotic new destinations, and meeting people from all walks of life are major drawcards for working on a cruise ship. Many cruise liners seek massage therapists who are skilled across a number of massage modalities, including whole body and deep tissue massage for travellers dealing with a pre-existing injury or who may need a remedial massage treatment for pain management. One of the greatest perks about being trained in massage therapy is that it gives you the flexibility to work from home or to be self-employed. This allows you to build your own loyal client-base, work from home, and be your own boss. The opportunities for massage therapists starting their own business in the industry are endless. You can choose your own hours which can help to support a part-time job or study, and it gives you more freedom to build a network through social media or friends and family. Working from home is also a great way to earn extra income and to support your massage therapist training all the while learning about running your own business. A lot of massage therapists choose to ‘go mobile’ with their skills and run a mobile massage therapy service. Mobile massage takes the traditional massage service ‘on-the-go’, allowing clients who are too busy or who physically can’t attend a massage clinic in person to be treated. Generally, as a mobile massage therapist you’re self-employed. However, there are massage clinics and day spas that utilise mobile services, allowing you to work independently while representing the company. A mobile massage therapist can attend offices, client’s residential homes, weddings, parties, or aged care homes. As a mobile massage therapist visits their clients on-site, they’re required to bring their equipment with them. Corporate massage has also become popular, with businesses hiring a mobile massage therapist to visit and give employees massages as part of their individual workplace wellness initiatives. Training in deep tissue massage is recommended for mobile massage therapists, particularly when visiting corporate offices. A good understanding and experience in whole body massage is also preferred, allowing you to deliver the right treatment for the diverse range of clients you’ll be visiting. The right qualifications and training are the first step required for any career in massage therapy. Start your journey and explore the endless career possibilities through a course with Discover Massage Australia today.